What if I more than crushes? I will shout it out to the world! Popcaan has confirmed that his new album is almost ready. The Unruly Boss has been quietly working on the follow-up to his 2014 album Where We Come From. The deejay confirmed on Instagram yesterday that his next body of work is coming soon. “Album getting closer and closer .. #unruly,” he wrote. There aren’t a lot of details available about the project and the deejay’s camp wasn’t forthcoming when DancehallHipHop reached out for more details. Sources only told us that it is coming sometime this year, possibly by summer. 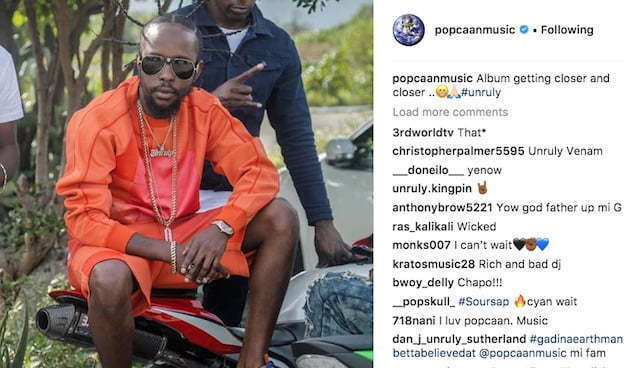 Popcaan’s debut album Where We Come From was released on June 10, 2014, and all signs are pointing to another June release for the “Everything Nice” deejay. His last album spawned a number of hits including “Love Yuh Bad,” “Addicted,” “Hold On,” “Everything Nice,” and the title track. We’re told that he has been working on the new album over the past year which explains his reluctance to release new music. The last time Popcaan released a new song was in November last year when he released “Rich & Bad” a song produced by Buju Banton son Markus. That track will likely make it to his new album. Aside from locking down in the studio to work on his new project, Popcaan is currently sharpening his acting chops after landing a key role in the upcoming Netflix film “The Intent 2.” He will play a villain in the film along with famed Jamaican actor Louie ‘Ox’ Rankin. “Big dreams wey me have thank god me still living it,” Poppy wrote while showcasing a clip from the movie set.